Hollywood, CA – Award-winning composer JOHN SWIHART whose career is on a stellar trajectory since scoring “Napolean Dynamite” five years ago scores “Youth in Revolt.” He has successfully traversed the musical landscape from performer with the Blue Man Group to scoring numerous films and TV series. Swihart’s signature “indie” musical style to Napolean Dynamite is still mimicked today by numerous composers. The film is distributed by The Weinstein Company and will be released January 8, 2010. Soundtrack available January 5 on Lakeshore Records. 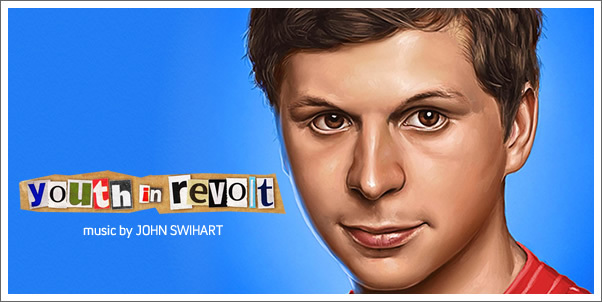 Youth in Revolt stars Michael Cera (Superbad, Juno) and is directed by Miguel Arteta. The coming-of-age comedy puts a fresh stamp on a tale of adolescent obsession and rebellion. Based on the acclaimed novel by C.D. Payne, YOUTH IN REVOLT is the story of Nick Twisp (Cera) —an affable teen with a taste for the finer things in life, who falls hopelessly in love with the beautiful, free-spirited Sheeni Saunders (Portia Doubleday) while on a family vacation. Nick abandons his dull, predictable life and develops a rebellious alter ego: Francois. John Swihart began his musical training at the age of four studying piano; by eight, he added the saxophone, followed by guitar studies at Indiana University --- while still in high school. He then continued his formal musical training of composition, production and engineering at Boston’s prestigious’ Berklee College of Music.